People walk through Moscow's Red Square in March. Both the House and Senate intelligence committees are investigating Russian interference in last year's presidential election. When U.S. intelligence agencies spy on Americans, they&apos;re supposed to get a warrant. But what happens when they&apos;re spying on a foreigner and an American calls up? The way intelligence agencies handle what they call this "incidental" collection of information — and what political leaders eventually do with it — will be a big part of the next phase in Congress&apos; investigations about the Russian interference in last year&apos;s presidential election. The House Intelligence Committee announced Friday that it has invited FBI Director James Comey and National Security Agency Director Adm. Michael S. Rogers to a closed hearing on May 2. The two appeared March 20 at an open hearing. The House committee has also invited three former national security officials from the Obama administration — former CIA Director John Brennan, former Director of National Intelligence James Clapper and former acting Attorney General Sally Yates — for a subsequent open hearing that has not yet been scheduled. Democrats on the House and Senate intelligence committees want those investigations to focus on the potential connections between President Trump&apos;s aides and Russia&apos;s interference. Republicans have charted a different course: an inquiry into how Americans can be swept up in government surveillance and whether politicians — specifically leaders in President Obama&apos;s administration — might have abused what they learned. Here&apos;s what happened: In January, the Washington Post reported that retired Lt. Gen. Michael Flynn, the campaign aide who went on to serve briefly as Trump&apos;s national security adviser, made several telephone calls to Russia&apos;s ambassador to the U.S., Sergey Kislyak. The detail, sourced to "a senior U.S. government official," appeared in a column posing questions about Trump&apos;s connections to Russia ahead of his inauguration. It later emerged that Flynn did not tell the truth about the details of his conversations with Kislyak to others in the White House, including Vice President Pence, and he resigned. Flynn also received tens of thousands of dollars in payments from Russian entities and has offered to tell his story to members of Congress only in exchange for immunity from prosecution. But what Trump and his allies in Congress call the big story here is that some senior Obama administration official, per the Post, had leaked the name of an American — Flynn — in an abuse of power, because that information is highly secret. Americans&apos; names are supposed to be redacted or "masked" in the secret intelligence reporting that circulates within top official channels. If two foreign diplomats are overheard talking about a "U.S. person" — a term of art that applies to a number of things (an actual person, or a company, or a ship or an aircraft) it appears as something like "U.S. Person 1." So someone in the Obama White House, evidently cleared and authorized to view reports about ongoing surveillance, may have asked for Flynn&apos;s name to be "unmasked." That person — or someone else who may have had access to or know about the intelligence intercept — then spoke to Post columnist David Ignatius and revealed the detail. Later, the Post reported that officials on the National Security Council revealed to the House Intelligence Committee&apos;s chairman, Rep. Devin Nunes, that Trump himself, as well as other aides, may also have been swept up in surveillance of foreign targets after the election. Then-national security adviser Susan Rice had viewed reports about the surveillance and asked the intelligence agencies to reveal, or "unmask" the names of the Americans who had been caught up, the NSC officials revealed. Trump and his aides have hung their lantern on that part of the story. The president told the New York Times that he thought Rice may have committed a crime. 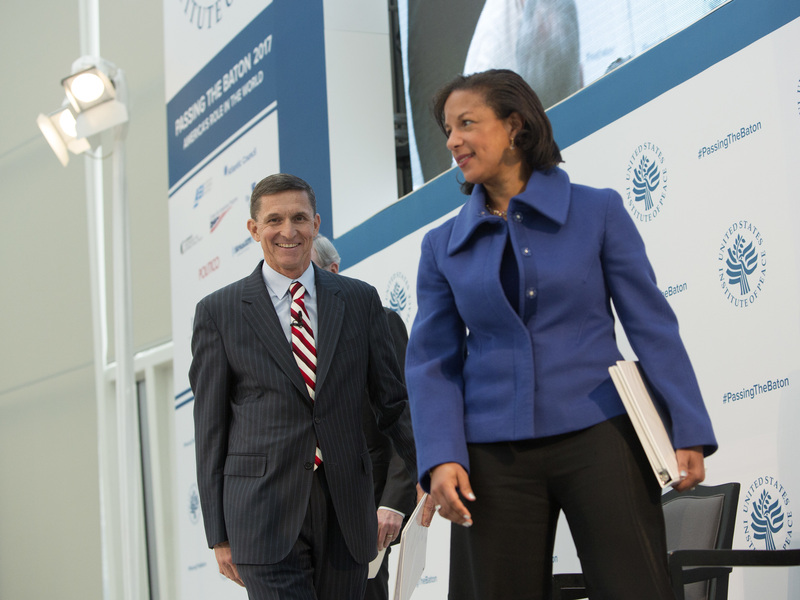 Rice has denied leaking any classified information or doing anything wrong. And some members of Congress who have viewed the secret documents at issue say they&apos;ve seen no evidence of anything unlawful. The next chapter in the story will begin when the House and Senate committees announce their next public events. Democrats want to hear from Trump&apos;s former aides, including former campaign Chairman Paul Manafort, foreign policy adviser Carter Page and gadfly Roger Stone. Republicans want testimony from Rice. Raj De, who served as general counsel at the National Security Agency during the Obama administration, says he doesn&apos;t believe the public facts in the case so far are out of bounds. "It&apos;s not uncommon for an intelligence recipient, in given circumstances, to request for a name to be unredacted, if it&apos;s necessary, one to understand the intelligence — [which] is the standard, or two, if there&apos;s potential evidence of a crime," he said. The number of Americans who have had their identities unmasked is not clear, and privacy advocates also complain that the U.S. intelligence community has stonewalled requests for information about the number of people swept up in "incidental" collection. Elizabeth Goitein, a privacy advocate at the Brennan Center for Justice, says it&apos;s worrisome that the standard for unmasking Americans&apos; identities is "understanding the importance of foreign intelligence." "That may not sound like a major loophole, but the definition of foreign intelligence information in the statute is so broad, it would encompass casual conversations about current events," she told NPR. "So it&apos;s actually quite a significant loophole." Sen. Ron Wyden, D-Ore., asked Director of National Intelligence Dan Coats to promise at his confirmation hearing that he would get the intelligence community to give Congress answers about the number of Americans who have been swept up. Coats said he would do everything he could, but he called it "an extremely complex process, for a number of reasons." Goitein said the intelligence community and its supporters in Congress have good reason for not making a public estimate. "The number&apos;s going to be enormous," she said. "If we learned that it was actually tens of millions — or more — of Americans&apos; communications, we would understand that the term &apos;incidental&apos; here is somewhat meaningless." All the Trump-Russia-unmasking storylines are playing out at a time when one of the key provisions in law that authorizes "incidental collection," Section 702 of the Foreign Intelligence Surveillance Act, is set to expire later this year. De, the former NSA general counsel, told NPR that law is one of the most — if not the most, in his words — valuable sources of surveillance authority for helping guard U.S. national security right now. Advocates say it gives American spies the ability to move quickly in tracking potential threats without some of the bureaucracy that encumbered them in the past. But the timing of the Russia imbroglio has given new fuel to opponents of that power. Rep. Raul Labrador, R-Idaho, pointed to the Post&apos;s report about Flynn&apos;s phone conversations as an example of the dangers of the political abuse of intelligence. "For me, it had a chilling effect ... the thought my political opponents could use my personal information, that they maybe gathered in some private communication, against me in the future. That should be quite terrifying to anybody, whether you&apos;re a Republican or a Democrat." Meanwhile, the bosses of the U.S. spy agencies fear that, in the partisan hothouse created by Congress&apos; parallel investigations, the discussion about the use and potential abuse of surveillance could confuse what they consider separate issues. When the House committee convened its first hearing, for example, Rep. Trey Gowdy, R-S.C., pointed out that the surveillance of Flynn was most likely done under a statute other than Section 702. "But in the eyes of people watching, it is the U.S. government officials leaking the name of a U.S. citizen," he said. "And if it can happen here, it may happen there. Trust me, you and I both want to see it reauthorized — but it is in jeopardy if we don&apos;t get this resolved."